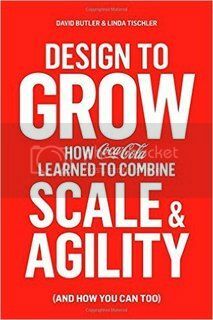 With Coca-Cola in the title of the book itself, this book got into my must read section. That the book is on the design process within the company and outside raised my curiosity and I immediately started reading this book on my pad. The world is no more as we knew it, so would say the old timers. For a 125 year old company like Coca-Cola many things have changed and evolved, except maybe for one thing – the uniquely great taste of Coca-Cola. Not many people know the complexity behind the powerfully innocent fizzy drink. There is obviously more to the world’s largest beverage company than the fizzy drink that bears its name. The book is not about design, as the conventional design that we know of. It details the concept that design thinking is not for the specialists alone! It is something that can, and should, be applied by anyone in the organization to get through almost any challenge. It is not a cosmetic change applied, but a methodology of integrating different disparage items into a well-oiled orchestra, to produce a symphony. Design is about bringing in cohesiveness amidst the entire chaos. The book is filled with anecdotes of how little changes done at the elementary background level made huge impact. Among many examples, my favourite is the one on “Design Machine”. As a regular user of the tool, it intrigues me that why could someone not think of this earlier. As a matter of fact, it is still not implemented at most of the major MNC’s I know of. Such simplicity with such wide scale system wide impact, removing layers of redundancy and saving on costs, bringing in agility in the execution. Agility. A key trait of a startup and a desired quality by every organization worth its salt. The author suggests planning backward for agility. Instead of the normal process of planning and then measuring its results, start with results and then form your plans around it. The design with purpose process can create real substantial value only when scale and agility are combined, and this achieved with the power of Design. A good book for anyone interested to know the workings of a company and a must read for startups.